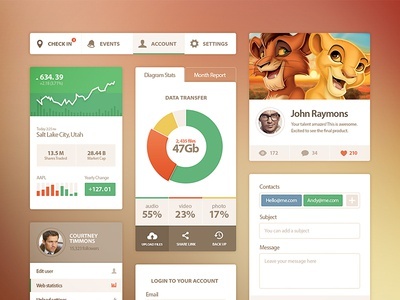 Freebie PSD: Flat UI Kit — Here's a freebie psd of the widgets I've worked on for fun. These are mainly design exercises that I did for warm-up/cool-down. Check out the full size and/or download the psd. Hope you guys can get some use from it. EDIT: Arr! Check out the Drunken Parrot UI Lite (free). 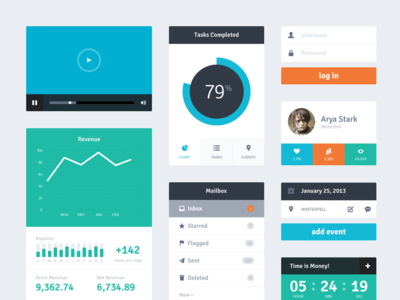 It's a UI kit with both HTML and PSD, with the complete Bootstrap components, as well as extra stuff. 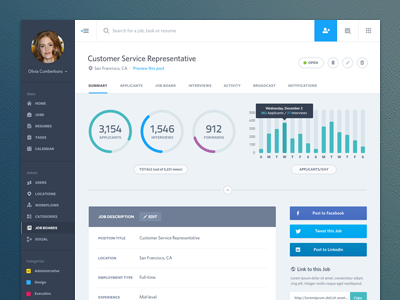 Dashboard Web App Product UI Design: Job Summary — Hey folks, Here is the Job Summary screen of a career app project. This is the admin view with some metrics and job description. Peep the attached view for a closer look and let me know what you think. Ui Kit — I hate marking time, there's always a chance to try something new! Some experiments do pay off, what do you think about this one? ................. As usual see the full-size image in the attached file.